For once, Kua Kia Soong is saying something that not only makes sense but could help Suaram defend itself against claims that it is an Anwar Ibrahim's puppet. He's saying that the Selangor state exco members should all RESIGN if they are not prepared to embrace the principles of collective responsibility and defend their boss, Menteri Besar Khalid Ibrahim, against allegations made by their comrades outside Selangor. Question is, is Kia Soong the lone pro-Pakatan voice on this? Since this is a "personal opinion" of his, will Suaram even support their adviser? So far in the Selangor menteri esar controversy, the wrong people, namely Pakatan Rakyat leaders outside the state leadership, have been making allegations against the Menteri Besar amidst much sound and fury. Actually, the only people who are accountable to the voters of Selangor are the Executive Council members who have been part of Khalid Ibrahim’s Cabinet all these years. We have heard so many allegations against Khalid but the state Cabinet, except for one, has been silent. So far, only DAP state exco member Teng Chang Khim has stepped forward to defend Tan Sri Khalid Ibrahim, disagreeing with claims that the Selangor Mentri Besar has been acting unilaterally on a number of key administrative matters. 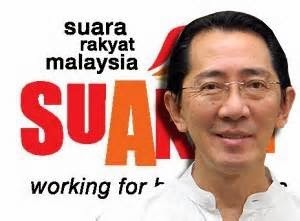 Teng has said that it is not true that Khalid had not consulted others when making important decisions, or that the Selangor executive council was “kept in the dark” over a new water deal that was signed between the state government and the federal government recently. Now, would you believe a Selangor State Exco member who is prepared to bear collective responsibility for the MB’s decisions or would you believe someone who is not in the state cabinet? Well, you may say Teng is just one out of the whole state cabinet. But if silence from the rest of the state cabinet is not to be interpreted as consent then they have forfeited their right! You can’t have your cake and eat it; you can’t enjoy a minister’s salary and allowances but plead ignorance when it’s your collective responsibility to bear! For years, we have rightly criticised Ministers of BN component parties for being UMNO puppets and that is what Reformasi was supposed to change, wasn’t it? The hope was to reinstate good governance demonstrated by collective leadership incorporating transparency, democracy, accountability and public participation. So now, let’s hear our state Executive council members speak – Has Tan Sri Khalid lived up to these principles in the last 6 years as Selangor MB? If not, why didn’t you speak out or resign in protest? – August 6, 2014. * Kua Kia Soong is an adviser for Suaram. Finally the Trojan horses are revealed. This time from DAP. Earlier it was PAS and PKR. Jika terkena pada Umno atau BN, agak-agak apa reaksi mereka ? Sudah tentu mereka 'berdoa' bergembira Umno hancur dan lenyap ! Khalid's cabinet are a bunch of church mice. They remind me of a story in the bible, during the time of King David. Uriah and his army were facing the enemy. He gave the order to charge, and gallop full speed, only to realize a while later that he is on his own. He was slaughtered. And so will be Khalid. Belated Selamat Hari Raya RB & family and blessings always, inshaallah.